I find music a great inspiration, not just listening while I am designing, but the song titles and lyrics give me visuals, especially when they relate to nature. 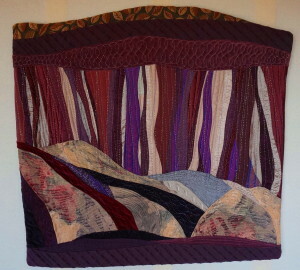 Song titles that I have used for a few quilt names are “Landslide” by Fleetwood Mac, “Purple Rain” by Prince and “Starry, Starry Night” by Don McLean, and “Calm before the Storm” by John Fogerty. “Here comes the sun” or “I’ll follow the sun” or “Good day Sunshine” – Beatles “You are the sunshine of my life” – Stevie Wonder “the warmth of the sun” – The Beach Boys, “Soak up the Sun” – Sheryl Crow The list can go on forever! Lately, the Beatles song “Strawberry Fields Forever” is lingering in my head, and I’m thinking I could have fun with an impressionistic style!